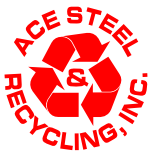 Household Appliances - Ace Steel & Recycling Inc. Ace wants your old appliances, and will pay for your worn-out washer, deceased dryer, or old oven that's given up the ghost! Microwaves and dishwashers also have value, so be sure to bring them to Ace! When an appliance goes belly up, it's steel can be recycled for re-use in new products. In addition to saving space in landfills (it's actually illegal to dump appliances in landfills in most states....) this helps preserve our natural resources and saves energy. Most appliances are around 75% steel, so they're perfect candidates for recycling once they've reached the end of their useful lives. Some fifty-five million appliances are retired from service each year, and 70% of them are recycled, making up around ten percent of the steel processed by the recycling industry. In addition to steel, appliances contain aluminum and copper that can also be recycled. Recycling your appliances is great for the environment, as recycled steel requires just a quarter of the energy it takes to mine and process new steel. Another "appliance'" that Ace will take is fitness equipment. That broken-down treadmill, elliptical, or stationary bike occupying space in your basement or garage has a steel frame along with plenty of copper wiring that we'll pay you for! Here's how it works; load up your appliances and bring them to the dock on the east end of our building. We'll weigh your vehicle with the appliance, then re-weigh it after the appliance is unloaded. We'll generate a ticket for you at the window for you to redeem at our front desk. It's easy and painless, and within a matter of minutes you'll be on your way home with a money in your pocket. Questions? Give us a call at 342-8649; our experienced staff is waiting to help. We're open weekdays 8-5, and Saturday 8 - noon. Be part of the solution, with Ace Steel & Recycling!